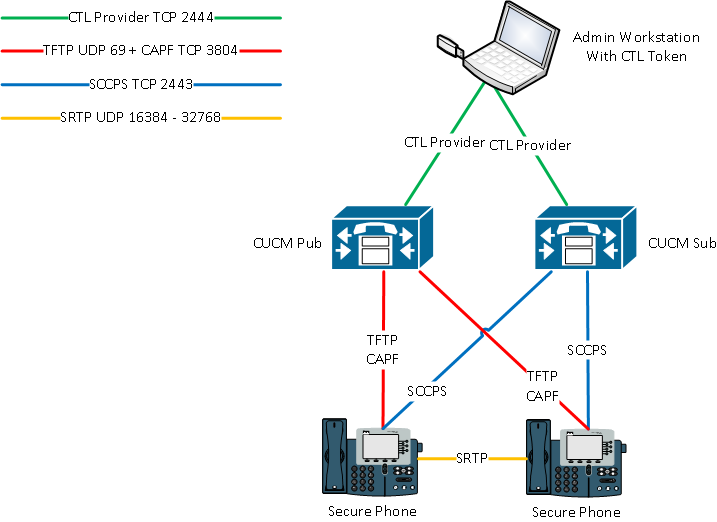 Cisco Systems - Technical Support: What are the functions provided by Phone Security with CTL ? What are the functions provided by Phone Security with CTL ? What are the configurations steps of CTL . What are the function of phone secuirty with the CTL? Authentication of TFTP downloaded files (configuration, locale, ringlist, etc) using a signing key. Encryption of TFTP configuration files using a signing key. Encrypted call signaling for IP Phones. Encrypted call audio (media) for IP Phones. Note that the first two functions can also be provided by Security By Default using ITL. The second functions of encrypted signaling and media can only be provided by using CTL files. Refer to the Security By Default document for more information on Authenticated and Encrypted configuration files. At least two USB eTokens are required for turning on Phone Security. These tokens are the key to signing the CTL file, and must not be lost. Multiple tokens can be used in a CTL file for redundancy since they are so important. They should be stored in secure, separate locations with their current passwords also stored safely. In case a single token is lost or destroyed, the other tokens used at the initial signing of the CTL file can be used instead. A token will self destruct after 15 failed password attempts, so remembering the token password and having backup tokens is extremely important. 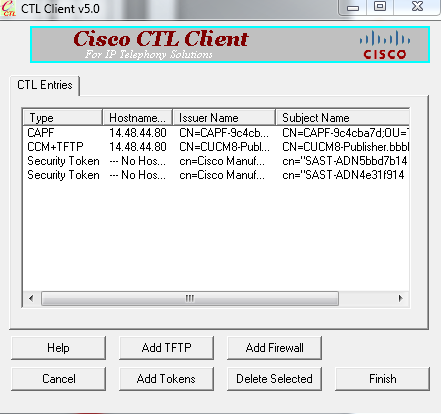 CTL Provider accepts connections from the CTL Client to generate the CTL File and collect certificates from all nodes. The CAPF (Certificate Authority Proxy Function) service is responsible for signing and storing LSCs (Locally Significant Certificates) from phones. Starting in CUCM 8.6 Windows 7 is finally supported with the CTL Client. Make sure to download the correct CTL Client for the OS in use on the client PC. This turns off auto registration and creates a CTL file. This allows auto registration to be enabled and leaves any existing CTL file in place. This is the default mode so cannot be selected unless the cluster is already in Mixed Mode. This allows any new certificates or servers to be added to the CTL file. 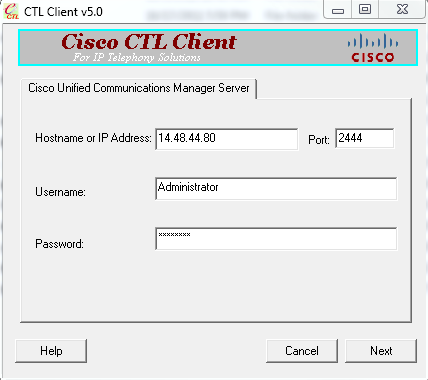 At this point the CTL Client performs connections to all CUCM servers in the cluster on TCP port 2444 to retrieve existing CallManager and CAPF certificates. This requires proper name resolution if using host names under "CCMAdministration > System > Server". The list of all servers and certificates is displayed, along with all tokes in the existing CTL file. If only one eToken is displayed, the "Add Tokens" option must be used to add another token before the cluster can be set to Mixed Mode. Once Finish is selected, the CTL Client will ask for the private key password of the USB eToken. This allows the eToken to be used to sign the newly created CTL file, which contains all of the certs and tokens displayed above. Note here that the password has been incorrectly entered once. 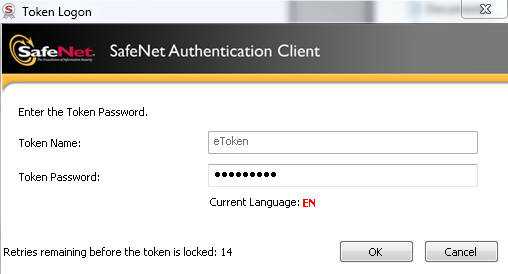 The eToken software warns that only 14 more attempts are allowed before the token is permanently locked (destroyed). A successful password entry resets this counter back to 15. If the correct password is entered, the CTL Client unlocks the private key from the eToken and uses it to sign the CTL File. This newly signed CTL File then gets written to every server on the cluster using another connection to the CTL Provider on TCP 2444. 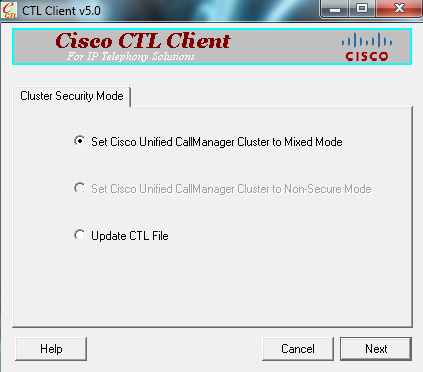 Again this requires network connectivity and name resolution from the CTL Client PC to each server in the cluster. The recommended procedure is to restart all TFTP servers, followed by all servers running the CallManager process. Restarting the TFTP servers allows the TFTP process to load in the newly generated CTLFile.tlv. Restarting the nodes running CallManager causes the phones to reset and download the new CTL file from the configured TFTP server. Do you really want to restart ? 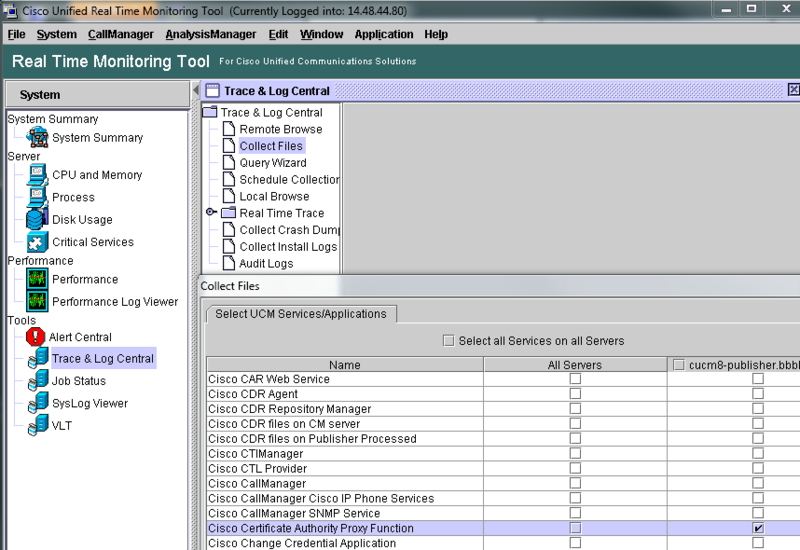 After the CAPF service is activated and the phones obtain the CAPF certificate by downloading the CTL File, phones can connect to CAPF to obtain LSC files. Set the phone CAPF Certificate Operation to Install Upgrade using Device > Phone, or Bulk Administration Tool > Phones > Update Phones > Query. After setting the Certificate Operation, reset the phones. If Null Sting or Existing Certificate have been chosen as the authentication mode no further action will be required. If a string was chosen for the Authentication Mode then this will need to be entered manually into the phone console. Now that all of the underlying pieces are in place, phones can have security enabled via the Phone Security Profile. These profiles are specific to the model of phone being configured. A profile will need to be created for each model of phone in use. The separate checkbox for TFTP Encrypted Config controls whether or not the CUCM server sends an encrypted TFTP configuration file to the phone. The encryption of the TFTP file is independent of the Device Security Mode settings, but an encrypted config file is recommended on phones that support it. The Security Profile needs to be applied at the Device level, so the Bulk Administration Tool is the most appropriate method to apply this profile to a larger number of phones. Adding Phone Security to a CM cluster brings an additional layer that must be considered when planning and performing administrative tasks. Items such a certificates and certificate expiration dates should be taken into consideration. Certain administrative operations like changing host names may require regenerating certificates and CTL files. The troubleshooting section here supplements the official Troubleshooting Guide and will provide steps to identify the current state of a cluster and recommend any corrective action necessary. 1. 1. Verify all certificates on all servers. Collect serial numbers, Common Names, and expiration dates of current CAPF.pem and CallManager.pem certificates on all servers. The certificates loaded onto the CM servers are extremely important. Any mismatch in certificates on the servers could cause phone LSC download failures, configuration file authentication failures, or phone registration failures. Here is the CAPF.pem certificate. Note the easily identifiable random string in the Common Name. This comes in handy as a quick verification tool. The CAPF.pem is used to sign LSCs (Locally Significant Certificates) and for the SSL handshake between the phone and the CAPF process. This CAPF.pem expires in 2016, and was generated on April 5, 2011. These pieces of information tell us what dates to watch for in the future as well as what operations happened in the past. 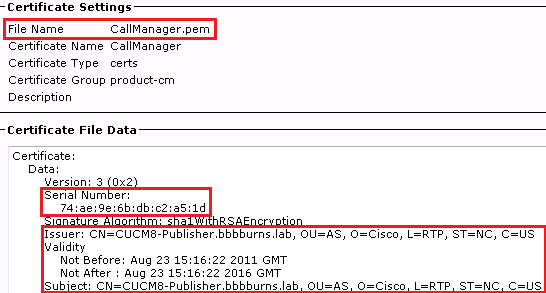 This becomes more obvious when the CallManager.pem certificate is shown. Note that the CallManager.pem certificate also expires in 2016, but was generated on August 23rd, 2011. Some certificate regeneration operation must have been performed on the cluster on Aug 23rd. Remember that this certificate is used in the SSL handshake between phones and the CallManager, as well as by the TFTP process to sign files. 2. 2. Verify CTL contents match current certificates. After checking the certificate contents, the next item to view is the CTL file on all TFTP servers. The OS Administration SSH CLI provides a simple command called "show ctl". 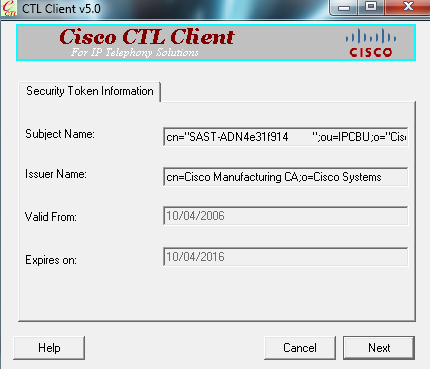 The header of the CTL file contains the date the CTL file was last generated, the CN (Common Name) of the USB eToken used to sign the CTL, and the eToken serial number. Note that the CTL was generated AFTER the CallManager.pem certificate generation date above. This is good because the CTL file should contain the latest version of the CallManager.pem. If the CTL file had a date that was BEFORE the CallManager.pem or CAPF.pem file generation dates, the CTL Client would need to be run again to get the latest certificates. The first entry inside the CTL is the full certificate of the eToken. 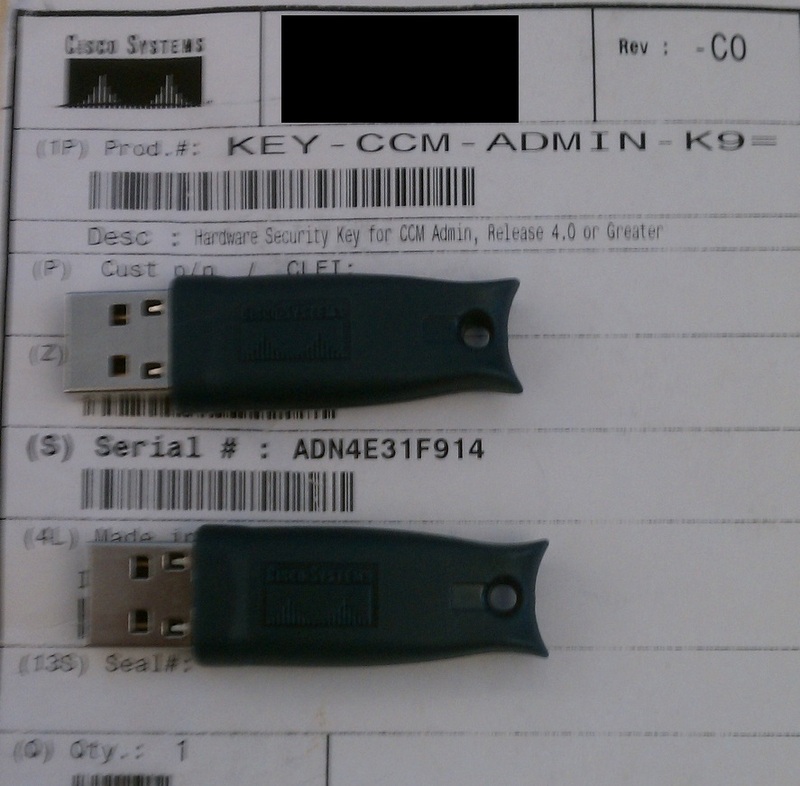 This eToken with a serial number of "ADN4e31f914" was the eToken used to sign the CTL file. The serial number is printed on the token packaging and on the token itself, so the serial number in the Subject CN (Common Name) can be helpful to match the tokens used during signing. Multiple tokens can also be included inside the CTL file. At least 2 eTokens must be present in a CTL file. One token will be used for signing, and the other token is simply present as a backup trust point. The phone will trust any CTL file signed by other of these two tokens. This output shows that the following eToken wasn't used to sign the CTL file, it's just the backup eToken. To update the CTL file at least one of the tokens inside the current CTL file must be found. The next record after the eTokens is the CallManager.pem certificate (denoted by function CCM+TFTP). This certificate is used by CM to sign configuration files and establish SSL connections between phones and the CM server if a Secure Profile is used on the phone. Note that the serial number here matches the serial number in the CallManager.pem in the OS Admin page above. If this serial number differed between the two places, the CTL Client would need to be run to bring the CTL file in sync with what CM is actually using for a certificate. The final entry in the CTL file is the CAPF certificate. The serial number here also must match the OS Admin CAPF.pem, so phones are allowed to connect to the CAPF service. If there is a mismatch the same step of re-running the CTL Client must be performed. At the completion of this step, the CTL file will be in sync with the certificates loaded onto the CM servers. The next item to check in the troubleshooting process is whether or not the CM server is providing a CTL file via TFTP. A quick way is to take a packet capture at the IP Phone or the CM TFTP server. Here the phone requests the CTL file as the first file it downloads at boot. The phone requested a CTL file, and if the filter on the previous capture is removed the transfer of that file can be viewed in detail. Another method to verify the CTL file is downloaded is to look at the Phone Console logs under the web page of the phone. This requires the setting "Web Access" under "CCMAdmin > Device > Phone > Product Specific Configuration" to be "Enabled". 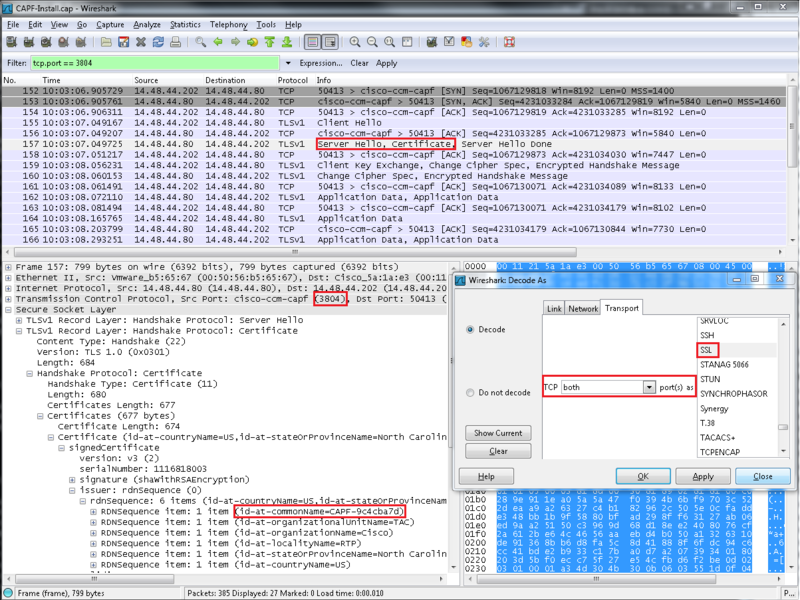 In addition to packet captures and phone console logs, the TFTP traces also show TFTP file transfers. Here is a shortcut to view the current TFTP trace in real time as a phone resets. 4. 4. Verify phone properly validates and accepts the CTL file. After verifying the CUCM server is presenting a valid CTL file, the next step is for the phone to validate that CTL file. Status Messages displayed on the phone can also be helpful to verify a CTL file was downloaded successfully. If the phone fails to validate the CTL file, that means the phone's existing Certificate Trust List does not have the same eTokens inside of it that the newly downloaded CTL was signed with, or that the newly downloaded CTL was corrupt. A corrupt CTL can be checked with "show ctl", looking for the output "The CTL File was verified successfully", or the error condition "Verification of the CTL File Failed". Generally a corrupt CTL file can be repaired by running the CTL Client. If the phone's old CTL file contains only eTokens that are no longer available, the CTL File will need to be deleted from the phone manually. At this point the dilemma is "Did the phone download the latest CTL File?". The Status Messages and Phone Console logs can be used for verification, but other methods also exist. The simplest method for verifying if a number of phones have the correct file is to compare the file sizes of the CTL file on the phone with the file size on the TFTP server. First, create an SSH username and password for the IP Phone under CCMAdministration and enable SSH on the phone. Reset the phone. Next SSH to the phone with the configured username and password. When prompted for the second login use "default / user". This example discusses 7961 and similar model phones. Use the following debug guide for 89XX and 99XX model phones. In 8.6(2) and later versions of Communications Manager this hash should be visible on the server with "show ctl" and "show itl". Prior to 8.6(2), use TFTP and md5sum to verify the hash of this file as it exists on the server. This example checks the hash of the ITL file. Just replace ITL with CTL and the example will work for both files. A shortcut to verifying that the CTL file on the phone matches exactly byte for byte with the file on the server is just to quickly look at the phone's Trust List. The name of the CM / TFTP server does match with the name of this server's CallManager.pem file. The CAPF- also matches the CAPF.pem certificate that is currently in use. Now that the phone has a CAPF (Certificate Authority Proxy Function) certificate via the CTL, the phone can connect to CAPF to download a certificate. A packet capture on the CM server can be used to verify the CAPF SSL handshake completed. Here the filter captures all traffic from the IP of the phone. Then the file is uploaded to another server using SFTP and the "file get" command. 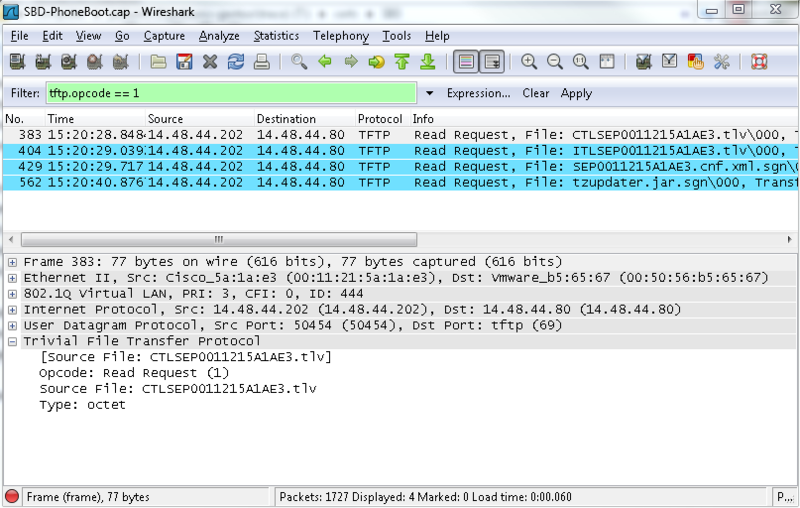 The packet capture shows the SSL handshake that happens on the CAPF port, TCP 3804. To view this exchange, right click on any packet in the TCP port 3804 stream and go to "Decode As". Here the certificate presented by the CAPF server matches the certificate in the CTL, and the certificate the phone displayed earlier. This SSL handshake succeeded because it started sending "Application Data", which would be the CAPF exchange. 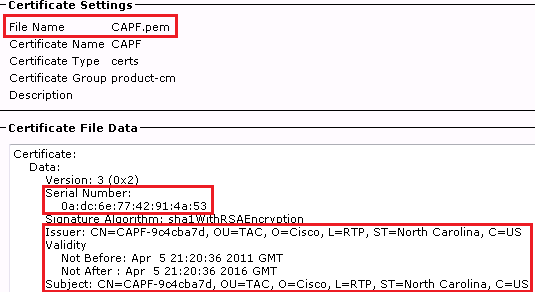 If that process had failed despite the SSL handshake success, the next spot to examine would be the CAPF traces. If the SSL handshake failed, it would be time to check the CAPF certificate and update the CTL file again with the CTL Client. 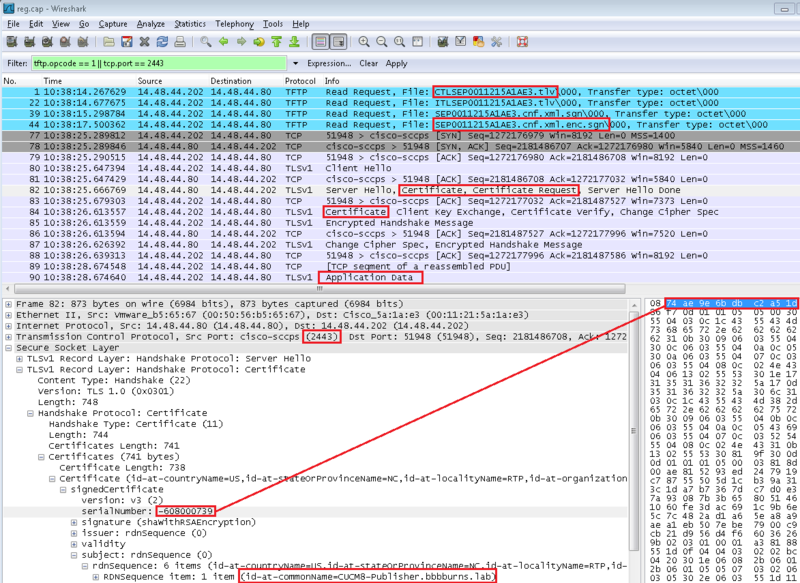 The CAPF traces show that the phone connects, generates a key (which takes some time as seen by the gap in traces), then the CAPF server generates a certificate for the phone. 10:03:08.060 | debug TLS HS Done for ph_conn . Now that the phone has a CTL and LSC, the next step is secure phone registration. For SCCP phones this happens on TCP Port 2443. Use the same steps as before to capture all packets from this specific phone. The first thing that's different is the phone downloading SEP.cnf.xml.enc.sgn. This signifies and encrypted TFTP configuration file as set under the Device Security Profile. Here the phone connects on TCP port 2443, so this port must be Decoded As SSL in Wireshark. The CUCM presents the CallManager.pem certificate (verifiable by serial number and common name) and then asks for the certificate of the phone. As before the SSL handshake completed successfully since the Application Data phase is reached. Calls that have both encrypted signaling and encrypted media will show the lock icon in the lower right corner of the call window. This corresponds to Device Security Mode: Encrypted. Calls that use encrypted signaling between both ends, but that do not use encrypted media will show the shield icon. This corresponds to Device Security Mode: Authenticated. A new application is out in app-store for your iPhone. i-Hoot is offering you free $5 worth of call credit to make cheaper free business calls anywhere in the world. You have to download this application on your iPhone, then you can start making calls to any of your contacts in your contacts' list using this application.